The Flashlight has white, red and blue-green lenses (instrument and map reading). It is waterproof made of lightweight and corrosion resistant materials. 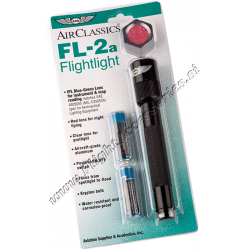 This flashlight can be used for preflight inspections as in the cockpit during night flying with red lens installed. It has an extra Krypton bulb stored within. Pilot companion, compact LED flashlight illuminates in red, green, or white. A flashlight is a must have for every pilot's flight bag. 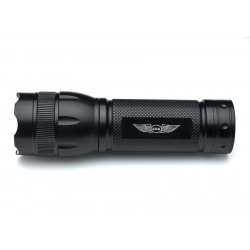 In or out of the cockpit, this conveniently sized, long lasting, and durable flashlight serves as a great pilot companion. This 3-in-one LED flashlight toggles between red, green, or white depending on your cockpit needs. With an LED life of 100,000 hours, the included alkaline batteries can keep this flashlight illuminated for up to 17 hours in "red" mode, and 14 hours in "white". The on/off switch located on the bottom allows for easy cycle through the colors. No separate color filters, separate heads or extra attachments are required. The adjustable flashlight head allows for easy flood and spot beam settings. The lightweight aluminum body is durable and weather resistant and the ergonomic textured handle allows for easy one hand operation and compact storage. Profesionalna akumulatorska (polnilna) ročna svetilka Lafayette, svetilnosti 900 lumnov, polnjenje preko USB ali 240V. Primerna za vse, ki iščejo zmogljivo svetilko ter odporno na vremenske vplive. 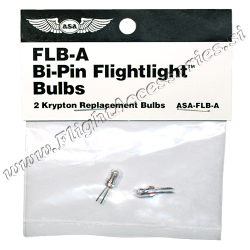 Spare Krypton light bulbs. Used in the ASA Flightlight.